The Loire Valley of France: A Bargain Hunter's Paradise! The Loire Valley of France is a huge wine producing region surrounding the Loire river running from just southwest of Paris all the way west to the Atlantic ocean. This gigantic wine region produces almost every style of wine you can imagine, from light, dry whites to full-bodied reds to sticky, sweet dessert wines, and everything in between! So why do so few American wine drinkers know much about the Loire Valley? For whatever reason, many parts of the Loire have gone without much recognition in the US except for by wine aficionados. While the worldwide fame of regions such as Bordeaux and Burgundy have lead to a huge demand and escalating prices, the price for Loire Valley wines, many of which are reviewed below, has remained relatively stable, for the most part. Is this because Loire wines are not deserving of praise? Absolutely not! In fact, in many points in history, some Loire wines have been among the most sought after in the world. The moral of this story is that the wine world and global demand for wines is somewhat fickle. But that means that those of us in the know about the quality and breadth of styles coming from the Loire are at an advantage! The Loire is a great source for inexpensive but great red and white wines. While this newsletter is too brief to include an in depth exploration of all the wines of the Loire (there are dozens of sub-appellations within the Loire! ), here is an introduction to some of the most famous regions and the styles of wines produced. Muscadet: The western-most parts of the Loire are famous for their crisp, dry white wines from Muscadet and surrounding regions. The predominant grape here is Melon de Bourgogne. This light, refreshing wines are usually drunk young (although the best examples can age nicely! ), chilled as a thirst quenching apéritif or as a perfect match to fresh seafood. Being near the Atlantic ocean, seafood is abundant here and these wines are great with shellfish, raw oysters and other lighter fish dishes. And best of all, these wines are downright cheap! Almost all examples are under $20 and many are less than $10! 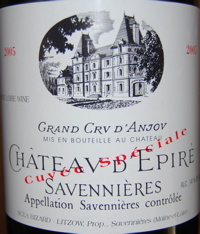 Anjou (Savennières, Coteaux du Layon, etc. ): As one moves east through the valley, this region marks a difference in style and grapes. This is mostly Chenin Blanc country (know also as Pineau de la Loire in some parts), producing various wines from bone dry to super sweet. The most celebrated dry wines come from Savennières, a tiny region near Angers which makes wines that age fabulously for decades. These complex and elegant wines start their life dry, full of stony minerality and vibrant fruit flavors and evolve into rich, luxurious wines of great depth, length and texture. While prices have risen a bit, the best examples, from producers like Baumard, d'Epiré and Joly (a few of which are reviewed below), are still generally under $40 and many in the $15 to $20 range. The Coteaux du Layon, across the river, produces sweeter wines from Chenin Blanc many of which utilize botrytis, the fungus that concentrates grapes helps produce many of the worlds most famous sweet white wines (know as "Noble Rot" you can learn a bit more about Botrytis on our How is Wine Made page). The best wines, particularly those from the small grand cru appellation of Quarts de Chaume, can be comparable to the best sweet white wines in the world, but often much less expensive than the best sweet wines from Sauternes, Alsace, and Germany. Chinon, Bourgueil & Samur-Champigny: The area to the west of Tours is mostly red wine territory with Cabernet Franc being the most important grape in these regions. While Cabernet Franc is a relatively minor grape in Bordeaux for most wines (with some exceptions in St. Emilion, most notably the famous Cheval Blanc), it is the predominant grape in the blend of most of these Loire reds. The styles vary from lighter fruity reds to full bodied, serious, age-worthy wines of great complexity. Vouvray: Just east of Tours is the village of Vouvray. These vineyards on hilltops along the Loire river are another of the truly great terroirs for the Chenin Blanc grape. 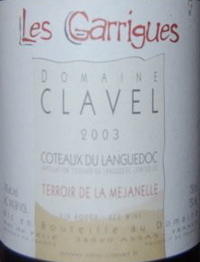 Wines here vary from dry (known as "sec"), to off dry ("demi-sec) to sweet ("moelleux"). All the versions can age beautiful, often for decades. One producer stands head and shoulders above all the rest and has for decades. Huet has made beautiful wines for almost a century. While the top sweet wines (Cuvée Constance is a revelation!) are quite expensive, the sec and demi-sec wines are affordable. A couple of them are reviewed below. Other excellent producers are even cheaper and are usually abundant in fine wine retail shops. Another bargain hunter's tip is to search out the sparkling wines made here, often labeled either as Vouvray Pétillant (lightly sparkling) or Vouvray mousseux (fully sparkling). The best examples, are outstanding sparkling wines and much less expensive than most good Champagne. Coteaux du Loir and Jasnières: This region, lying on a tributary of the Loire, the Loir, is somewhat removed to the north from the other appellations of the Loire. Several wines are produced here, including some red from Pineau d'Aunis, mostly from Chenin Blanc. 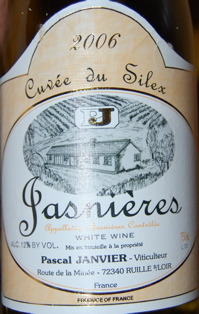 Jasnières, the most famous of the vineyards, is small, more wine coming from the surrounding Coteaux du Loir. These can both be hard to find in the US but some good examples show up from time to time. The best are bright, mineral driven wines which sometimes have a hint of sweetness which are somewhere between Savennières and Vouvray in style. A couple examples imported by Kermit Lynch are reviewed in this issue and an excellent inexpensive Coteaux du Loire from Benedicte de Rycke was reviewed in Issue 001. Sancerre, Pouilly-Fumé, Quincy, Reuilly, Cheverny & Touraine: The eastern-most appellations of the Loire Valley predominantly make white wines from the Sauvignon Blanc grape (although a small amount of rosé and red wine is also made from Pinot Noir, particularly in Sancerre). While the style of these wines vary somewhat from region to region, they are typically bright, food-friendly wines which have zippy acidity. The best examples, particularly those from Sancerre and Pouilly-Fumé, can have a fresh grassy-ness and flinty minerality that gives them great complexity and grip on the palate. While the best of these wines can get relatively pricey, for the Loire, the great majority are still relative bargains and the best wines from the less famous appellations such as Quincy and Cheverny can be downright cheap. See the reviews of a few of these wines below! There is also a review of a very good (and cheap!) Cheverny in Issue 002. I hope this brief introduction helps you open your eyes to the wines of the Loire Valley. There truly are great Loire wines which do not cost an arm and a leg for just about any style of wine you desire. Most of they are great with food or alone. Pick up a few the next time you go wine shopping and start your own exploration of this fabulous and diverse region. 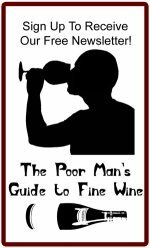 For additional recent reviews of Loire Valley wines see back issues of the Poor Man's Guide to Fine Wine. Proper wine storage is critical to the appreciation of fine wine. Once a wine has been stored poorly and is damaged, it is irreversible. So don't let it happen in the first place! Learn about the best ways to protect your investments. There are many types of wine openers available. Which is best? Well that all depends on you. Learn about the various types of wine openers and their advantages and disadvantages. You can read on and get tips on how to best open a wine bottle. You've probably heard that good wine glasses can enhance your wine tasting experience while bad ones can ruin it. Well its true! There are even different glasses for each style of wine, specifically designed to enhance the nuances of each wine so that it shows its best. Don't get intimidated, get educated. Here are some tips about how to choose wine glasses and the various types you can buy. Cava is a Spanish sparkling wine. For years it was a cheap, pitiful imitation of the real thing, Champagne. But now, for several producers who have struggled to improve, it is no longer pitiful...just cheap. Many Cava are very good now. No, they aren't Champagne, but they are a great bubbly substitute that you don't have to apologize for. This one is one of the biggest producers. You can find it all over the place! But that doesn't mean its bad! The doughy nose of fresh grapefruit juice and pits with a touch of melon is very pleasant. Not to mention the big, rich fruit flavors. Full bodied, but simple and a tad on the rustic side, this offers great flavor and fun without pretension. Good, simple, rich sparkler for close to nothing. One Star. Importer: CIV, Sacramento, CA. 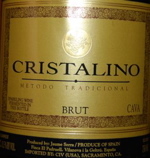 As mentioned above for the Cristalino, Cava is a sparkling wine from Spain. Here is another good example which can be a great substitute for Champagne as an apéritif or to accompany food. This particular one is made from a blend of three Spanish grapes that you don't hear much about...Parellada, Macabeo, and Xarel-Lo. This is not a doughy, yeasty sparkling wine. No, this is on the other end of the spectrum with bright Pippin apple and peach pit nuances with a rich, creamy apple juice spiked flavor. Not the most refined bubbles but this is powerful enough to stand up to some rich dishes and while not complex, it is definitely not lacking in flavor. One Star. Importer: Vitis Imports, Inglewood, CA. As I've attested to before, Savennières is a hidden (for now) gem in France which can make world-class white wines. Baumard is amongst my favorite producers and it is no secret that I adore this wine. Made from a vineyard shaped roughly like a butterfly, hence the name "Clos du Papillon" ("enclosed butterfly vineyard"), this is my favorite Sav Baumard makes. Classic aromas of almond, wool, lanolin and chalky minerals fill the glass and lead to an intense wine of linear, bright and vibrant flavors which reveals finely etched white stone minerality. Classic Sav and super young. This is awesome young for you fans of infanticide but really needs at least a few years to show well. For those of you who know Savennières well, this may shut down in a year or two and take the better part of a decade to really blossom and show its stuff. Great stuff! 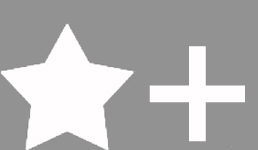 Two Stars Plus. Importer: Ex Cellars Wine Agencies, Solvang, CA. For you long-time readers (all two of you), you know that I am a fan of d'Epiré. A traditional producer of Savennières, this special blend is from their oldest vines and their best vineyard sites, right near the Coulée de Serrant. Ripe apricot, creme brulée and a hint of botrytis fill the glass. From memory this is less complex than the 2004 at a similar stage but it may just need more time. 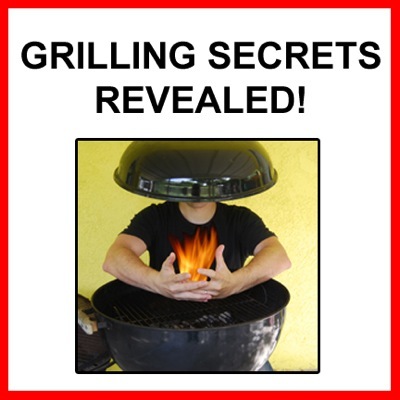 The flavors are bold, spicy and vibrant with a creamy, waxy texture. Long, rich, ripe juice, this is very young but will be great with time. Not as intense and linear as the Baumard above, but more of an opulent version with much potential. Two Stars. Importer: Kermit Lynch Wine Merchant, Berkeley, CA. Oh boy! What can I say about Huet! One of my favorite domaines in all of the world! Started by Gaston Huet many years ago, this domaine is synonymous with great Vouvray. I sat down with Monsieur Gaston several years ago, at age 90 (he has since died unfortunately), and enjoyed his company over many of his profound wines. He was the mayor of Vouvray for many years! While the King has passed, the Domaine goes on, producing some of the finest Chenin Blanc that has ever graced the lips of mankind. This wine, from the vineyard next to the domaine on the very top of the Vouvray hill, has a beautiful nose of floral schist with many delicate, finely etched nuances. The flavors are better pictured than tasted...vibrant, laser-like...with layers of minerals, chalk, granite and every stone you can imagine. A wonderful expression of the natural wonder of the Vouvray terroir. This is my kind of wine. Two Stars Plus (very close to three stars!). Importer: Robert Chadderdon, New York, NY. Another from the master of Vouvray, this sec comes the Le Mont vineyard. A more hesitant stoney aroma is followed by fine crushed rock, stoney and pure. Delicious, elegant. A wine of purity and finesse. 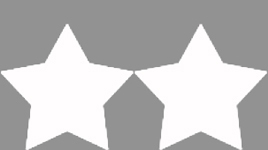 Two Stars. Importer: Robert Chadderdon Selections, New York, NY. The Coteaux du Loir is an area along a small tributary to the Loire Valley in France. 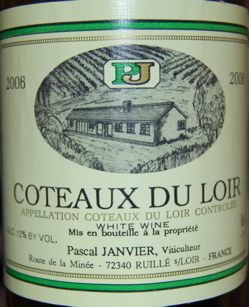 While the most famous appellation in the are is Jasnières, the Coteaux du Loir makes many wines from nearby which tend to be a bit simpler and earlier to mature than those. This is made from 100% Chenin Blanc. Fresh honeyed citrus and chalky minerals lead the way to rich and round, yet fresh and vibrant, flavors of apple, oyster shell and Mandarin orange. Pure and both rich and lively at the same time. This is an excellent value for good French white wine for drinking now and over the next several years. One Star Plus. Importer: Kermit Lynch Wine Merchant, Berkeley, CA. From the same producer as above, this is a wine from the small, but even more respected, Jasnières appellation, also 100% Chenin Blanc. This wine started off with a weird aroma which I can only describe as "tincture of benzoin". If you are not a doctor or nurse you may not relate but it was a weird, but not unpleasant, medicinal/chemical aroma. I couldn't quite make sense of it, but I think it may have been flawed a bit. Maybe just a bit of reduction and/or brett, which can have a chemical, "bandaid" type smell. However, with extensive aeration it blew off for the most part and revealed bright chenin fruit and stones. There was still a hint of it though! The flavors were less concerning with zesty, high acid, steely minerality with a hint of honeyed but tart fruits lurking in the back. Very young, tight and linear. If the weird aroma of reduction or whatever it is goes away this should be very nice indeed. For the time-being, I'll be a bit cautious. Tentative Two Stars. Importer: Kermit Lynch Wine Merchant, Berkeley, CA. Joly is know as being an uncompromising adherent to, and one of the earliest practitioners of, biodynamique farming. Emphasizing an almost spiritual adherence to natural farming to improve the soil and guarantee healthy vines and grapes, this technique has gained many advocates as well as critics. 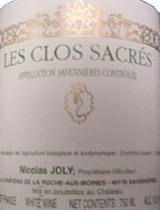 He produces several Savenniès;res, 100% Chenin Blanc from one of the most famous tiny appellations in the Loire Valley. While his top cuvée, the Coulee de Serrant, can be fairly expensive, this Clos Sacres is still reasonable. Rich honeyed aromas of apple sauce, cinnamon and chalk are very Chenin but almost too ripe and even a tad oxidized for a wine this young. Maybe it is just in a funky stage. The flavors are classic with wool, wax and a bitter honeydew with chalky, over-ripe peach. Young but quite rich and flavorful. This doesn't quite have the nervous energy and zip that one would expect from a Sav this young. This needs time to resolve itself and I'm hoping that the hint of over-ripeness and oxidation will integrate. If they do then my score will improve. For now, One Star Plus. Importer: Vintus LLC, Pleasantville, NY. 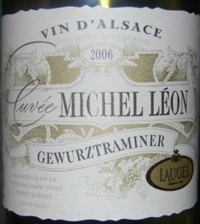 Gewurztraminer, meaning "spicy" Traminer is a grape that really reaches its peak in Alsace, the French region near the border with Germany. Famous for its Riesling, Gewurztraminer, Pinot Gris and Muscat, the region is one which has both stupendous white wines and interesting food. Try a good Alsatian Choucroute Royale and you'll know what I'm talking about. This is a super-cheap Gewurz. You can find it at Trader Joe's. While most cheap Gewurz are insipid and nothing like a true, profound one, this one has hints of what it really should be. Pretty honey, lychee fruit and wax aromas provide a very pleasant introduction to a slightly off-dry wine with round, fruity lychee and apple fruit flavors. It is simple but very nice with a low acid, round feel that accompanies rich but spicy seafood dishes beautifully. One Star. Importer: Plume Ridge Wine Negotiants Industry, CA. This is a German producer I do not know well. 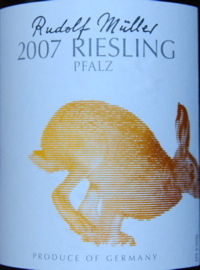 It is a Riesling from Pfalz but without a specific vineyard designation. Aromas of fresh honeydew, melon and gooseberry lead the way to melon and soft chalk flavors which are slightly sweet, simple and refreshing. Very tasty and a great food wine. One Star. Importer: Wine Sellers, Ltd., Skokie, IL. Sancerre is one of the two most famous regions for Sauvignon Blanc in the Loire Valley (see above). It is known for intense, grassy, mineral imbued wines that are extremely versatile at table. This example has a restrained nose of vibrant stones. The mouth, intense, chalk and granite minerals with bright and vibrant Sauv blanc fruit and no obtrusive oak. A really great value for Sancerre. One Star Plus. Importer: Weygandt-Metzler, Unionville, PA.
Quincy is a small appellation from the eastern end of the Loire Valley not far from Sancerre. Like its more famous siblings it is made from Sauvignon Blanc, but tends to be a bit cheaper. Juicy, fruity and simple, the pretty aroma of gooseberries is followed by juicy, ripe gooseberry, melon and grapefruit flavors. Not as much brightness, depth and minerality as the Sancerre above, but very good for what it is. One Star. Importer: Vigneron Imports, Oakland, CA. The Ventoux, in the southern Rhône, produces many inexpensive wines which can be just as good as their richer neighbors if they come from good producers. This one is 80% Grenache and 20% Syrah. 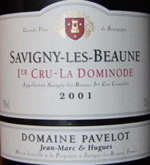 The nose of this wine is smokey, with bacon and toast accenting the peppery black fruits. Dark, grapey, black fruit flavors follow which are simple but rich. This has a tannic structure which would be balanced nicely by rich, fatty meats. Excellent value! One Star Plus. Importer: Wine Warehouse, Los Angeles, CA. The Languedoc is a region in the south of France which produces a slew of wine. For years it was insipid stuff, but in the last few decades many producers have come on strong to bring this region into the limelight. Clavel has been one of these, producing excellent wines from the region. This one, named for the underbrush of the Provençal hillsides, les garrigues, is both inexpensive and delicious! Smokey, meaty, Rhône-like aromas of burnt rosemary, black licorice (fennel and anise) and blackberries entice you before the lusty, zesty and brambly wild, savage fruits and Provençal herbs and spice wine you over. A great, inexpensive Rhône substitute! One Star. Importer: Wine Warehouse, Los Angeles, CA. This wine from Rosso Piceno in Italy is about 60% Montepulciano and 40% Sangiovese. It sees 14-16 months in oak. The nose here cannot be mistaken for anything but an old-school Italian wine. Dusty and meaty with a hing of raspberry fruit leather. In the mouth, rich, meaty and smokey but it is quite suave and velvety for an inexpensive wine. There is a Sangiovese tang of tart red fruit on the end that keeps it fresh and lively. Outstanding value! One Star Plus. Importer: Empson Inc., Alexandria, PA.
Crozes-Hermitage is an appellation in the Northern Rhône Valley of France. Its red wines are made of 100% Syrah. While its name implies an association with Hermitage, another Northern Rhône region, it is somewhat removed and generally the wines are not as profound as those from Hermitage. However, they can be excellent, less expensive substitutes (Hermitage generally costs at least $50 and up to several hundreds of dollars for the best producers), particularly from the top producers. Graillot is certainly one of the best producers of Crozes. This wine has a great, heady aroma of dark rich black pepper, smoke, black licorice and smokey bacon. These classic Syrah aromas lead the way to a rich wine full of dark black, peppery Syrah fruit flavors, black licorice and ripe blackberry jam. Well built and without any hard edges, this should drink well and even improve for several years although it is approachable now. One Star Plus. Importer: Paul Bullard Associates, St. Helena, CA. As I've mentioned previously, Savigny is one village in Burgundy which has somehow resisted the incredible inflation in prices that has plagued the finest regions of Burgundy in recent years. It has no Grand Cru vineyards, so they are not as heavily sought after as such villages as Vosne-Romanée, Gevrey-Chambertin and Chambolle-Musigny. Pavelot is one of the stars of the village, making traditionally-styled, long-lived wines which are still a relative value (for Burgundy). The la Dominode is often considered his finest wine, making powerful wines. They often need more time to be at their best but when they are they really shine. There is some of this 2001 in the marketplace. Of note, last month I reviewed the 2005 version of this wine which was also very good but extremely young and needs even more time to really show its stuff. Smokey fennel, sappy raspberry and dried strawberry aromas are primary still but lovely. This wine, despite being already 7 years old is quite young and austere with deep stoney, smokey dark black fruits but with a white granite-like structure which is silky and fine. Earthy nuances lead to a suave and long finish. This is very refined for a Savigny which can often be a bit more rustic. This is a serious Burg with excellent potential! Two Stars. Madeira is a fortified wine produced on an island by the same name, technically part of Portugal. Their wines are know for being extremely long-lived. Because they are exposed to oxidation during aging, they tend to be very resistant to further oxidation and can age indefinitely. Blandy's is one of the biggest names in Madeira and the Sercial variety is the driest type of Madeira. A very complex nose jumps from the glass with smokey notes of maple syrup, pine, banana, raisins and brown sugar. With air this gets quite nutty, like honey-roasted almonds. The flavors do not disappoint either with silky, smokey, banana, nuts and just a slightly sweet and spicy finish. The inner mouth perfume is quite profound, feeling almost like huffing sweet vermouth with aromas of complex botanicals. 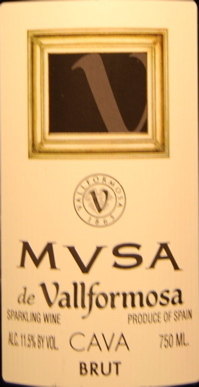 Not a dessert style of Madeira, this would make an excellent contemplative sipper or even an aperitif. Two Stars. Importer: Premium Ports & Madeiras, San Francisco, CA. © 2008 Poor Man's Guide to Fine Wine. All Rights Reserved.